Working from home? Adding a dynamic spin on sprucing up our office space. Design In A Box teamed up with Estate Living to share insights on refreshing your work environment. What’s more; the magazine is hosting an exciting give-away where you can win an Exclusive Design In A Box Package. Details on the give-away follow at the end of the article on this page. For a closer look, find us featured in the magazine’s June issue (p.32). Most people who work in an office from nine to five, spend between one and three hours every day commuting. Time better spent at the gym, strolling on the beach, shopping, doing chores, cooking delicious meals, or walking the dog. Commuting, plus the cost of fuel, undeniable effect of carbon emissions and the acknowledged dangers of extended periods of sitting. This has made working from home very desirable. The decreasing cost of technology and the development of Fibre to the Home (FTTH) has made it feasible. Working from home has its benefits.. While some employers are reluctant to let their staff out of their sight. Most recognise that people are much more productive when they can work within their comfort zones. That does not just include spatial. Fact, no one who spends eight hours in an office actually does a full eight hours of productive work. It’s just not possible. And the time that is not productive is wasted. Spent daydreaming, dozing, taking smoke breaks, making tea, checking Facebook, or just staring blankly at a screen empty minded. People who work from home, on the other hand, use those ‘unproductive’ moments constructively. Nothing improves mental concentration more than a short burst of physical activity, and it doesn’t have to be intense. Many freelancers pop in a load of laundry, work until they feel their minds wandering, whereupon they hang it up. They’ll then return to their desks mentally refreshed. You can substitute any domestic chore for laundry – doing some weeding, washing the breakfast dishes, prepping vegetables for supper, etcetera. An onsite worker only deals with this after spending all day in the office and hours in the car. Really, a home workspace is a no-brainer. But how to incorporate that workspace into your home is a tad more complicated. The simplest – and least efficient – is to simply work on the dining-room table. But that’s not really sustainable. You need a dedicated space for two reasons. Firstly, so you can work while others use that space. You can leave files or reference material out if you need to. And, secondly, so that you are mentally ‘at work’. Novelist Patricia Schonstein dresses in a smart skirt and blouse and puts on makeup every morning. So that when walking into her home office, she knows she is ‘at work’. I confess I am the opposite. Sometimes I leap out of bed with a brilliant idea and dash off to my desk to implement it before the inspiration fades. And then, later – much later – I’ll shower and dress. Although I am in my pyjamas, I know that I am ‘at work’ because I have a dedicated home office. So how do you create that home office, and how exactly do you want it to work? There are basically three strategies when it comes to setting aside space for a home office. The first is a dedicated room that is somehow isolated – even if only by a door. During work hours, the room should be off limits to the rest of the family. The second is a more open space where other family members may have a desk or table. So, for example, you can work while your kids do their homework, and maybe help out with the odd question. Or even brainstorm a tricky work issue with your 12-year-old. Even if you’re going for the more open option, a dedicated room is always best. However, you’d be amazed at how many people choose the darkest, coldest, pokiest room in the house for a study. Rather choose the sunniest room, and the one with the best view. A room you will want to spend time in. So you can work without eye strain during the day and don’t need to turn on the lights. The third option – if you are really pressed for space – is an ‘office in a cupboard’. This can be neatly built against one wall of the lounge or dining room. Surprisingly effective. This works really well if you only do occasional work at home, or you need only a laptop and not much in the way of paper. Having decided on which room you are going to use, you need to plan it all very carefully. Make sure you have a place for everything and everything in its place. You will, obviously, need a desk. 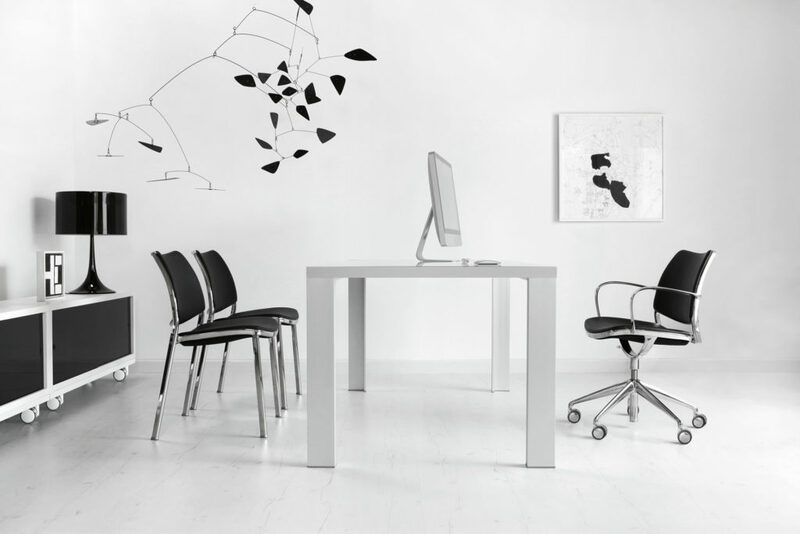 This is the nerve centre of your office space so design it around your work style. It could be just a table, or even a board across two two-drawer filing cabinets, or chests of drawers – surprisingly convenient and cost-effective. It’s also a good option to integrate a workspace surface into a shelf unit. You will also need a comfortable desk chair, and perhaps a couple of nice visitors’ chairs for small meetings. Depending on the look you’re going for, it may be nice to use old chairs that you can paint in a cheerful colour and re-upholster in bright fabric. You will need shelves and space for filing. Resist the temptation to store all your documents going back years. Do a good sort. Get rid of what you don’t need to keep, and archive what you need to keep but will probably never look at – like finished projects, client files, tax records, and so on – in neat, protective archive boxes or a filing cabinet. These can even be in the garage or some other little-used space. Place your desk in the best position to take advantage of natural lighting, which is the very, very best and by far the cheapest. If you are right handed, it’s best to have light coming over your left shoulder, or from the left in the case of windows. And, obviously, vice versa. Install good quality LED lighting, and also a bright, adjustable desk lamp that you can focus on your work rather than in your face. We have this fantasy of working under a palm tree with nothing but a laptop, but it is just that – a fantasy. We actually need to plug in so many things – modems, chargers for phones, power banks and possibly other things, desk lights, and, of course, your laptop. If the existing power points are inconveniently located, you have two basic choices: getting an electrician to wire in a new one, or using extension cords. Either way, you will need a good, conveniently placed multiplug with both two- and three-prong outlets. If you do use extension cords, keep them invisible and neat by fixing them to the skirting boards and/or running them behind shelves, or along the bottom surface of your desk. You don’t want to look like a kitten in a knitting basket. White is always a safe choice, and it is reflective so it contributes to good lighting, but you can get so much more exciting than that. Plascon offers a colour consultation so you can choose a colour scheme that will enhance your space according to your needs. Colours are not just dead attributes – they are living, vibrant entities of pulsating wave energy, so they affect our moods. But it’s not that simple. You also need to take into consideration your personal feelings about colour because different people have deep-seated, sometimes illogical, feelings about certain colours. A good colour therapist can work with that to create a space that is beautiful and in which you can feel comfortable and inspired. Or soothed, or relaxed, or energised, or optimistic. Even if you are a keen DIYer, you will probably need some help with the design and planning. You could engage an architect or interior designer, which can be quite expensive for just one room, and also necessitates a lot of time with site visits, discussions, approving plans and so on. But there is a great alternative. Design In A Box is an innovative online interior design service that will work out the optimum spatial layout of all the various elements you wish to have, and help you create a space that energises and inspires you with features such as colour, living green walls, good airflow, temperature control, ergonomic furniture, task and ambient lighting, art works and interesting treatment of floors, walls and windows. Design In A Box is the online platform of professional interior design team Rumour Has It, says CEO Analise de Beer. ‘By engaging online,’ she explains, ‘the client can get a bespoke interior design every bit as personalised as if they had gone the traditional face-to-face route, but at a fraction of the cost, as the whole process is on a fixed-rate basis.’ The process is fast, efficient and effective. You log on to their innovative, easy-to-use interactive website and follow the instructions to give the design team all the information they need to create your bespoke box, which will be delivered to your door. In the box you will find an accurate floor plan, mood board, optional elevations and renders, specifications, samples, shopping list and a supplier database. All you have to do, is take the list to Design In A Box’s select partners, and use your loyalty discount card and/or vouchers to create your fabulous workspace. Sometimes thinking in the box is the creative way to go. MAKE YOUR DREAM SPACE HAPPEN! Stand a chance to win a fabulous interior design personalised package to the value of R 12 999 from the interior geniuses at “Design In A Box”. This fantastic prize includes mood boards, floor plans, optional 3D renders, samples, colours and specifications, a step-by-step guide, shopping specification, shopping directory, supplier database and the “Design In A Box” loyalty card, which offers 15% discount from all there carefully curated partners such as Block and Chisel, Weylandts and Hertex. To enter the competition, like Estate Living’s Facebook page (https://www.facebook.com/estateliving/) to catch all the competition details OR send an email to louise@estate-living.co.za and tell Estate Living about the space you want to renovate and why you should win the prize.